Practice coding and typing with ASCII Text Art for any device! Students follow the code to type one of 26 letters. Teachers can use the editable PowerPoint to create a specific code for students to "crack" or have students create ASCII text art to spell their names, share special announcements, practice their spelling words, reveal a word of the week, and more! Also includes a detailed visual guide for creating and coding your own ASCII Text Art! Easily integrate technology into your typing, coding, or technology plans with this low-prep and engaging coding and typing practice activity. Also perfect for fast finishers! 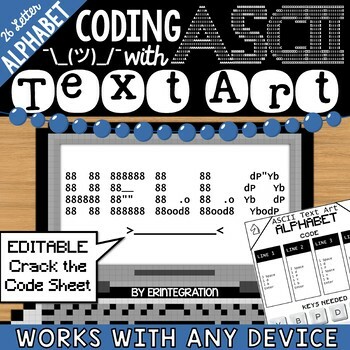 Coding with ASCII Art works on ANY digital devices and includes directions for Chromebooks, iPads, Windows, Kindles, as well as popular programs like Google Docs, Seesaw, and Microsoft Word. 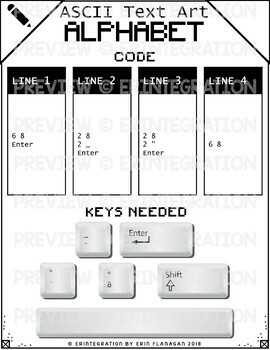 ASCII Text Art is created by using the ASCII characters (i.e. the standard characters on all keyboards) to create an image, or in this case, a letter of the alphabet. By arranging characters, spaces and lines in a specific way, the letter can be created on any word processing program or text editor. ★ 26 Coding Challenges to create an ASCII image to represent each letter of the Alphabet. 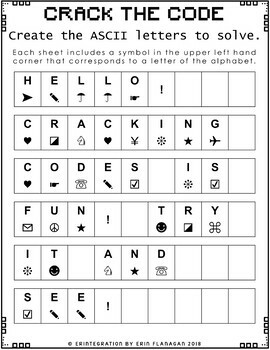 ★ Editable PowerPoint for creating hidden messages for students to "crack" by coding the corresponding ASCII letter! Perfect for special announcements or Escape Rooms! 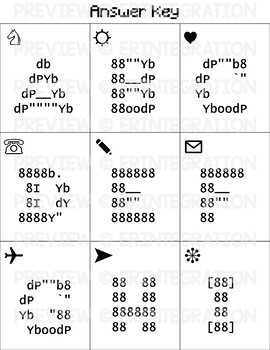 ★ Detailed guide to ASCII includes visual directions and tips for creating your own ASCII Art. Students will need digital devices with word processing or text editing software such as Google Docs, Microsoft Word, Windows Notepad, Notepad on Mac/iPad/iPhone, Kindle Docs, Apple Pages, SeeSaw, Pic Collage, etc. Google and Google Apps are trademarks of Google Inc. © 2015 Google Inc. All rights reserved. Microsoft Word is a trademark of Microsoft. Erintegration is not affiliated with and has not been authorized, sponsored, or otherwise approved by Google Inc. or Microsoft. By purchasing this resource, you agree not to create derivative resources for commercial sale or for free distribution beyond a single classroom using the formulas and ASCII images provided by Erintegration.